Many therapists are multi-passionate and have an entrepreneurial mindset. Below, I share 28 ways to add income to your business without adding more clients. I have included options that many therapists have heard of as well as options that are new to the therapy industry. I am a licensed professional counselor in Georgia and have been in the counseling industry for over 20 years and I have created income for myself using several of the methods mentioned below. I hope that you find an idea in this list that you can move on and implement soon. You can provide consultation for other therapists that either supports them clinically or in the development in their business. Consultation can be in an individual or group format. You can also be a consultant for other businesses that need the expertise of a mental health professional. Developing a private practice with other therapists either being contractors or being your employees. Under this model, you take a portion of the fees paid to the therapist in exchange for office space, help with credentialing on insurance panels, marketing and helping to fill their caseload. Many therapists take this option once they have personally become too full to take on other clients and want to have an in house referral source. If you’ve ever had the idea that can support the work that you do and provide a real solution for people that you can see as something people would be willing to give up their data space for, then creating an app may be for you. Some examples of popular apps that people use that are related to the mental health community are “Calm” and “Headspace” both of these apps help users with anxiety and incorporates mindfulness. If you are the type of person that has a penchant for organization and you are great at helping others get organized with a system that has worked for you, then creating a planner either for other therapists or for clients may be an option for you. Developing a podcast that deals with topics that are related to your area of focus and then tying it back into your area of expertise can bring exposure and business back to your practice. Once you hit a consistent stride with listeners and downloads, you can then get sponsorships. Online courses whether live or pre-recorded are a great way to share your expertise with others in a format where you can share and re-share with groups of people. 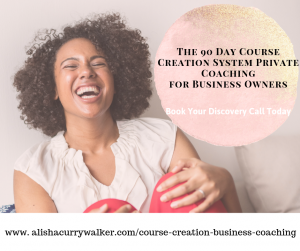 Courses have become one of the go to methods of growing a business for therapists, coaches and other service providers. The online course industry is now in the billions of dollars because consumers want to be able to get a solution in a timely manner and at their own convenience. I have a course that I developed that teaches therapists how to create their own online course. I have just finished teaching this course and will relaunch the course again soon. Creating content in a book or e-book form has become increasingly easier with the rise in self-publishing, ghost writers and transcription services. Creating a book in either format allows you to share your expertise with current and future clients or create an additional income sharing your take on a particular brand of help that others can use without having to come to therapy to receive help from you. I wrote and published a book entitled, I Love Being Married: A Guide to Divorceproof Your Marriage. I was able to sell the book, use it to get speaking engagements and use it as a resource for my marriage therapy clients. You can develop CEU workshops on either clinical or ethical topics. The workshops can be delivered in person or in an online live or pre-recorded format. Gaining CEU hours associated with your workshop is obtained either through your local counseling association or a national counseling association. Because therapists have to renew their licenses every 2 years, this is a great way to add income to your business. If you are a therapist who wants to help groom the next generation of therapists, this is a great option for you. Research what your state requires in order for you to provide supervision. Many states require a certain number of years post licensure and a certification in order to provide supervision. This is a great way to help the next generation of therapists and develop a new stream of income. Carving out at least one signature talk is not just a great way to market your practice, it is also a great way to position yourself as an expert in your niche and generate paid speaking opportunities. Speaking can add an additional stream of income to your business by sharing your knowledge on a topic that you may use to help your clients with all the time. Speaking can be the opportunity that gets you in the door or it can be the service that you provide to schools, non-profits, corporations, other organizations and events. As a clinician, you can plan a retreat for other therapists, couples, parents, women who are struggling with anxiety – you name it, these are all retreat possibilities. People love the idea of getting away from their every day life to retreat from and engage in new solutions to whatever the issue is that they want to address. If you have a business where you are looking for a way to transition clients who have worked through their concerns and may want a different type of support, retreats provide a great opportunity to funnel clients into another supportive option. Therapists who have a flair for making others feel welcomed, have an eye for detail and are planners can either become the go to person for your own signature event or become the go to person who helps other therapists plan their events. Some therapists really want to have their own event, but really have no idea where to start and would feel more comfortable with having a conference planner who has an understanding of the counseling industry. Many websites are looking for contributing writers or bloggers who can develop content on what’s considered medical/mental health related topics. Research some of your favorite websites, magazines and blogs to find out what their submission process is and if they pay for content. You may have to submit work for free until they see your contribution as something that they are willing to pay for, especially if it is one of the major magazine or blog sites. Many sites provide the opportunity to create affiliate links so that when you share your thoughts about particular products and or services, you can then provide a link for people to purchase that product or service. When people purchase through the generated link from the website, you will receive a portion of the sale. Amazon is an example of a larger online store that has an affiliate program where you can become an affiliate. You will be given a custom generated link so that every time someone clicks on that link and makes a purchase you receive a portion of that sale. YouTube has a program that allows you to generate income after your channel has 4,000 watch hours and 1,000 subscribers in the previous 12 months. At this point, your videos can be monetized through YouTube’s Partner Program. Even though YouTube is a huge platform with millions of videos, it is still a new space for therapists that can be used to generate exposure and develop a following that can then provide income. In the last 2 years, different types of directories have started popping up. Many of them generate income through a monthly subscription charged to the therapist for their inclusion in the directory. The person over the directory is then tasked with the marketing and promotion of the directory to make being included in the directory worth the time and payment from the therapists that are included. Online communities have become a great way to bring like minded people together around particular sets of topics or themes. Facebook has become the leader in creating groups where resources, discussions or even courses can be shared in one place. Facebook communities have become a staple in the online business community as one of the ways that ongoing support is provided when a group coaching program or online course is offered. The term white label may not be something that you are familiar with, but it is something that you have seen before. An example of white label content that you could sell would be if you have a group practice and you have developed excellent policies and procedures for your practice that have supported your growth. You could remove all branding and names of your company from the policies, make the document editable and sell the packet of policies to other therapists interested in creating group practice policies but either does not have the time, desire or know how to create their own. The counseling industry is closely related to the coaching industry and therapists make great coaches, especially if you are more solution -focused. People pay for coaching to help them solve a problem and they want a solution that can either save them time and or money. Coaching can be done in individual or group formats, in person or through video conferencing. Workbooks can support a book or e-book that you’ve created or be a tool that you can share with other therapists to help them support their clients. Workbooks can be a source you use as homework for your current clients, as a resource or support for an online course, CEU course or retreat that you develop. So much of what we do is online, but many people still love the feel of putting pen to paper. You can create a free write journal that supports the type of clients you see in your niche or a a guided journal that has specific writing prompts. The journal can be a support to your current clients or can be sold as a way for you to support others that can’t come to see you for therapy. You can teach either at the university level or through continuing education. Many schools require that you have a doctorate to teach at the collegiate level, however if you have a course that you want to teach at the college level that wouldn’t be for college credit, consider teaching a continuing education class. Many colleges provide continuing education classes on topics that range from project management to playing the piano to how to handle stress or conflict in the workplace. A membership site can be centered around any topic or idea. Membership sites can be housed either on your website or another platform where people can only access it with a username and password. Behind the password entry point, you can provide any of the previous resources for clients in one place that they can then access at their leisure to achieve a set goal. Some topic examples that would be great for a membership site are marriage and or relationships, business development, preparing teens for college….. There is a nominal fee for membership sites like directories that when lager numbers of people opt into the program, you can see a great return on your efforts. Every therapist needs a website, but not everyone has the skillset to create one. If you have that skill and are able to bring someone else’s vision to life, this is a great option for you. Additionally, because as a therapist you understand what is needed to make a successful website and can relate to what is needed, other therapists would be more likely to hire you to build their website than someone who doesn’t understand the therapy industry. Even though I have lumped these three together, they are not all the same. If you enjoy the process of marketing, developing a brand and brand identity or understand how to boost the SEO of your website, this may be an option for you. I have helped many therapists with their marketing and SEO because again they either don’t want to do it, don’t have time or the capacity to do it. This area is one that therapists often seek support from someone who can help them get the results they are looking for quickly. If you love social media and enjoy the live interaction, the back end analytics and key performance indicators, adding social media manager to your list of duties may be for you. You can provide social media management for other therapists, non-profit organizations, local government, blogs, online communities or corporations. There are opportunities to do this part time. Some businesses may not even be aware that they need this type of support and could be drowning in how to keep up or leverage their social media platforms. You can pitch these businesses with a plan of how you can help manage their social media along with how you will show proof of growth in their key performance indicators. Gone are the days where you can get all information for business growth for free. When you see therapists with booming businesses that have multiple streams of income that are not typically associated with the therapy industry, in all likelihood, they have been a part of a mastermind. I am currently paying to be a part of a mastermind. Masterminds are like group coaching on steroids. They provide a lot of resources, support, and business development that typically pushes you to exponential growth. Because they provide so much that can boost your bottom line by cutting through the process of you researching and trying to reverse engineer the steps needed to create business success, they can be costly. However, if you have the ability to help others grow their businesses with a system that you know works, you are in a position to create your own mastermind and have people pay you for your expertise. You can provide copy writing services if you have a way with words that propels people to buy your product or services. Creating compelling copy that moves people into action is a gift and a skill that other therapists would pay you to create for them. There is a huge growth in the subscription box industry and there are websites, resources, courses and membership sites dedicated to the success of a box that you create. There are subscription boxes for everything from meal plans, to date night, to science projects for girls to hair products, to people who are fans of the show The Walking Dead. If you have an idea that you believe could be supported by sourcing products, books, or even music from other businesses, then a subscription box may be for you. Subscription packages for the boxes can be purchased monthly, bi-monthly, bi-annually or annually. I have shared 28 different ways that you can add income to your business. I hope that this list gets your creative juices going and you move on one that you are the most excited about.